As I’ve written before, part of our vision is that Typeracer be more than just a game; we hope to make it an effective and fun tool for improving your typing speed. This is one of the main ideas that inspired Typeracer founder Alex Epshteyn, who decided to create Typeracer because he thought he typed too slowly! Playing Typeracer should help most people type faster–hopefully as much as American user “bblaise”, whose improvement is shown here. But, we hope we can do more than merely provide a place for people to practice. So, we are currently working on developing the best typing tutorial available on the internet. That’s the goal, at least. One of our first steps, aside from talking to some of the best typists in the world, is to try to understand what slows people down. One of the biggest problems for most people, of course, is that they make typos. I am determined to figure out why. In order to answer this question, I first need to know what mistakes people are making. So, I did some research. 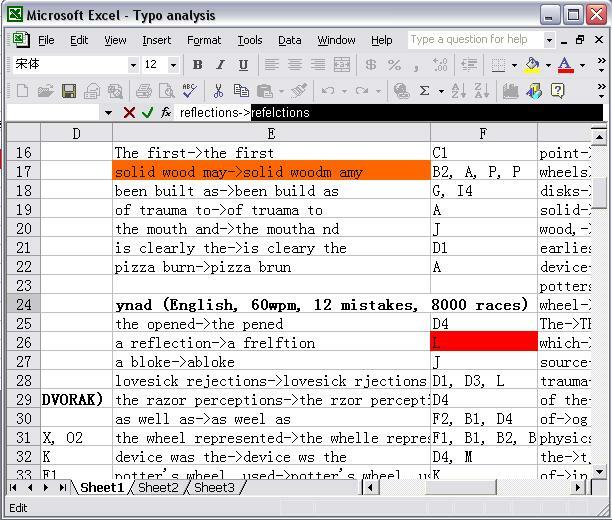 Dozens of Typeracer users participated in my experiment, in which they basically did some typing without fixing their typos, and sent me the results. I’m a bit slow, and haven’t finished yet, but here are some of the initial conclusions/results. 1) About 15-25% of all mistakes are on short words (3 characters or less). Words like “the” and “of” and “is” are words we’ve typed a million times before, but we still make a lot of mistakes on them. This is probably a result of people trying to type faster than they can actually handle. Also, for the fastest typists (approximately 90wpm and above), mistakes on short words made up a larger percentage of their total errors (25%, instead of 16% and 17% for the other two groups). 2) About 10% of mistakes occur on long words (8 or more characters.) Of course, long words are less frequent, so we might expect fewer mistakes here, but I still thought this was a bit surprising. 3) About 15-30% of typos are omissions of a single letter, such as typing “mjor” instead of “major”. Typists in my middle speed group (approximately 70-90wpm) made the most mistakes here (30%). 4) Nobody had a big problem with punctuation or capitalization. Each of these problems accounted for just 2-5% of typos for all users. 5) About 10% of the mistyped words are existing English words. For example, some people typed “to” instead of “too”, or “this” instead of “his”, or “build” instead of “built”. This seemed surprisingly high to me, and it suggests that people’s mistakes are sometimes more mental than mechanical. We’ve crunched a lot of numbers to understand the kinds of typing mistakes people make–and we’re still not finished! 6) Slower typists are much more likely to accidentally hit a neighboring key. For example, instead of typing “civilization”, one typist typed “cibilization”. For my slowest group (around 40-60wpm), 21% of their errors were of this kind. For the medium group, this number was 9%, and for the fastest group, it was only 5%. Not surprisingly, I suppose, these slower typists have more mechanical problems, and the fastest typists almost never have these problems. 7) The biggest mistake for my fastest typist group (by far) was adding extra letters to an otherwise correctly-typed word. I participated in the experiment myself, and typed “shasll” instead of “shall”, and “arazor” instead of “razor”. For my fastest typists, 46% of their mistakes were of this kind! Also, I think I know where these extra letters came from: 63% of the time, the added letter was a letter that also appeared elsewhere in the word (most common), or in the next word (also very common). For example, instead of “through”, one user typed “throught”, so that letter “t” got typed twice. Or, instead of typing “spin and”, one user typed “spind”, so the “d” from the second word got typed twice. It was not common for typists (especially the fast ones) to incorrectly add a totally random letter. 8) Slower typists are more likely to have multiple, consecutive errors. Ten percent of the errors of my slowest typists occurred in a series of incorrect words, but for my fastest typists the number was half. Fast typists seem to catch their mistakes more quickly, not letting themselves get caught up in “bad momentum”. 9) Fast typists are much more likely to make mistakes on rarer words (this was kind of subjective, but I used my best judgment.) My medium and slower typists made only 1% of their mistakes on these less commonly-used words like “etiology” and “mozzarella”, but 7% of the mistakes made by the fastest typists were made on these words. This provides support for what I have always suspected, which is that one reason fast typists are fast is because they have familiarized themselves with the common letter combinations and words–maybe just by typing a lot. So, when they type a word they might have never typed before, they have more problems and can’t keep up their super speed. 10) Fast typists are most likely to have problems with single letter reversals. For example, they might type “teh” instead of “the”, or “refelctions” instead of “reflections”. This kind of mistake accounted for 34% of the mistakes made by my fastest typists, but for the other typists, it was just above 20%. These are just some of my tentative conclusions. I need to do more analysis, and probably collect more data (if I have time). 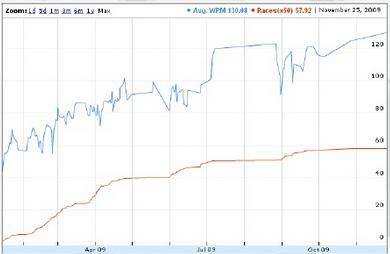 If there are any statistics buffs out there, or anybody wants to see my data, let me know. Our next step is to try and see how this insight can translate into practical suggestions that can be implemented, in order to help people type faster. I for one, cannot wait until the new tutor is released. Will it be available to everyone or only paid members? Some fascinating information there. I’ve always wondered about the differences between a faster typist (average of 101 according to the site) and more average speeds. I’ve not attempted to measure my casual typing speed, but I reckon it’s a baseline of 70. What I’m also wondering is what causes a typist to sort of plateau. I made gradual improvements from like 9th grade when I learned to type “properly” till maybe senior year of high school and have been kind of stuck for the 4 years since. Any insight on that? Hi Chris. Glad you enjoyed the post. Hopefully I can provide more info in the future. I wish I had a better answer to your question about plateauing. I assume, though, that there are a lot of factors involved. Some people probably have better dexterity in their fingers (it’s not surprising that a lot of the best typists on TR have used computers from a very young age; there are also a lot of programmers, as well as at least one professional organist, and probably some piano players–myself included). It could also be due to people’s different “processing speeds”. Lack of any effective, scientific methods for practicing may also be a factor (just typing is probably not the most efficient way to practice). Hopefully the typing tutorial that we’re developing will help with this last problem. Hello nice work here. You forgot to mention one type of error, which is the most frustrating of all. “Self-sabotage” or “choking” errors, the one where you tend to mess up when you are going at the top limits of your current ability to type, simply because you think “oh, my god, am I really going that fast?” or simply because your unconscious mind thinks you’ll get a score which you don’t really deserve to get. I’m a typeracer who’s used this site to improve a lot. And I’ve made such errors when I was typing 30 wpm. Made such errors when I was typing 80 wpm. Made such errors when I was typing 110 wpm. And currently do make such errors even at 140 wpm. Yes, this is a good point. I’ve certainly had this problem as well. That’s why I have written before that it might help to scroll down on the page while racing, so you can’t see your own score until you’re finished. However, even when this kind of “self-sabotage” happens, the errors that a person makes might still be accurately described using the categories I developed in my analysis; it’s just that people will make these mistakes more when they are tired, distracted (like you described), unfocused, etc. Also, I–like you–can also make mistakes when typing very slowly, which is a little couter intuitive. Thanks for your comment. I started touch typing a couple of months ago. I have found that Type Racer and a few other programs have helped me improve my speed considerably, but my speed and accuracy suffers considerably when I use a program like those used in Typing Skills Tests (the text is not highlighted and/or there is no cursor beneath typed word, errors are not shown), then although I’m currently typing around 45-55wpm (accuracy 90%>) on Type Racer, it drops to below 35wpm and 75% accuracy on a blind skills test. Perhaps Type Racer would consider a program within the new tutor that enables members to check and practice blind typing speed and accuracy and build confidence. The major reason that you do suffer on those blind typing tests is because you are relatively new.to typing. Once you get a hang on the common syllables, digrams and trigrams and become a more accurate typist, you’ll sail through as easily on those other typing tests as you do on typeracer (of course you might still be slower, due to the difference between first-time seen texts on those sites and practiced texts on typeracer). Hi Kathryn: What do you mean by the old, antiquated keyboard? I can relate to these observations. This kind of analysis provides a lot of value in addition to any typewriting material out there and should be expanded on! I have some background in data analysis and would like to offer my help but I would urge that any excel buffs with some time to spare should join. The Qwerty keyboard is not set up for speed, it was set up so the old typewriter keys wouldn’t hit each other and get stuck. They have another keyboard set up but I would like to know if anyone has tried it and or likes it. I believe there is software to install to use existing keyboard but might be pricy. Yes, the Qwerty keyboard was designed when people used manual typewriters. The Dvorak keyboard (new window) is one of the most popular alternatives. I am using it to type this message right now, and have used it for about 7 years. It’s not pricey. In fact, it’s free (Windows, Mac, Linux all support it with no additional software); you just need to change your system settings, and it’s easy to have multiple keyboard layouts on any computer (I have 4 “keyboards” installed on my computer–Standard Qwerty, Dvorak, Spanish layout, and a Chinese IME). There are lots of discussions about this topic on the Typeracer Forum. If you have any more specific questions, you can look at the forum posts above, start a new thread, email me (david at typeracer dot com), or ask here if you think that’s most convenient! Take care, and happy typing!